I remember fondly my musical interactions with saxophonist Paolo Recchia. I’ve played with many good jazz horn players in my career, but Paolo has the elements as a musician that make jazz fun; He swings, plays the blues convincingly, has a beautiful sound, listens and leaves space, too. This fantastic new CD is full of the moments that remind me of why I love jazz music in the first place. The other two members of this remarkable and empathetic trio are Enrico Bracco, whose guitar playing is clear, warm and confident with a strong sense of the history of his instrument, and Nicola Borrelli, who plays his instrument truly for what each moment in the music needs. The CD starts on a refreshingly breezy note, with Paolo’s piquant alto swinging easily on the melody of Gone With The Wind. Enrico’s solo is thoughtful and relaxed and then Paolo mixes lyrical phrases with some beautiful triplet lines while Nicola minds the time with ease and confidence in his bass line. Next is John Coltrane’s lovely ballad Central Park West, here performed in 5/4 time. I’m not always a fan of adapting classic songs into new time signatures, but this song and performance is a natural match for the lilting odd-time feel. Enrico plays some truly beautiful Pat Metheney-esque voicings and lines, but it obviously his own musical heart that infuses the lovely guitar comping in tandem with Paolo’s plaintive lyricism. Enrico’s playful composition Sman inspires some joyful interplay from the entire trio, and gets a little added flavor from a few well-placed Coltrane harmonic substitutions on the bridge. Nicola gets to showcase his formidable solo chops as well, on a brief but potent bass statement before the out head. Paolo’s composition Peace Hotel is up next, and what an amazing shift in mood it is; somewhat reminiscent of Lee Konitz’ playing with Bill Frisell and Paul Motian, but with a flavor and style that could only have been born from Paolo, Enrico and Nicola. It is an inspired and lovely soundscape in the middle of this CD, and suggests new avenues of musical exploration for the future. Lenny Tristano’s 317 E. 32nd St. gets a spirited run through, and Paolo’s extraordinary altissimo truly shines on this solo- not an easy feat on his horn of choice! Another composition by Paolo, Emmanina, is lovely and gentle- another blissful reverie in 5/4 time. I Remember You is very pretty, with thoughtful solos from Paolo and Enrico- the latter punctuating his eighth-note lines with intermittent voicings- a technique I’d love to hear more modern jazz guitarists employ! Nicola gets a short solo as well- short but burning! He always makes the most of his space. A sunny sounding coda and fade brings us to the next song, Nicola Borrelli’s Post-Aurum. Enrico sets up a strong pensive mood with an emotionally evocative intro, and the waltz that ensues is an inspired composition. Nicola has come up with a piece that is not simply pleasant to listen to, but one that digs into the melancholy corners of your heart. This is a special performance, one of the most emotionally open on the record. Bravo, Nicola. Cole Porter’s classic bittersweet Every Time We Say Goodbye closes out the recording, and the late night mood the trio sets is the perfect denouement for all of the beautiful playing that has preceded it. I am thankful and honored this amazing trio asked me to write the liner notes to this recording, which is remarkable in is patience, maturity and unwavering adherence to the qualities of lyricism, dynamics and vulnerability that are too often lacking in much modern jazz. 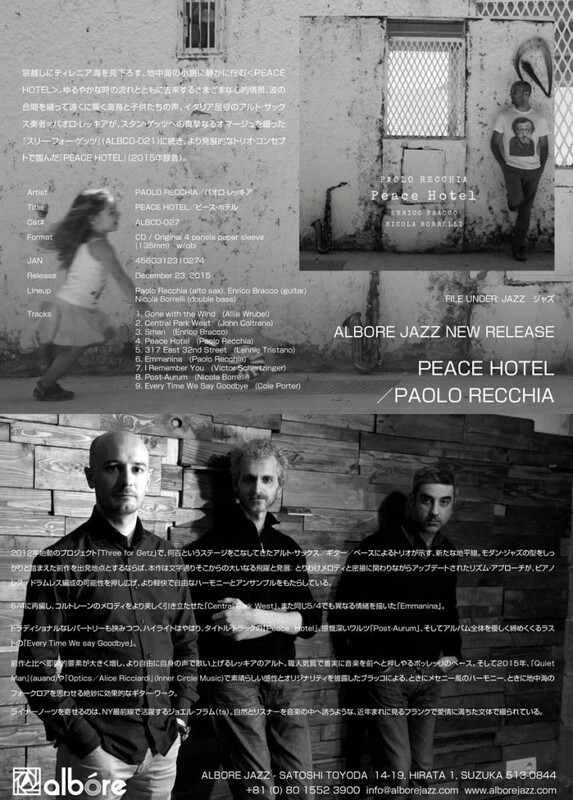 Paolo, Enrico and Nicola: congratulations on making a truly beautiful CD. It is a balm to the soul.